Eyebrows give a beautiful frame to the face, they highlight your eyes and enhance your features. Today you can read about 5 eyebrow mistakes women usually make when trying to pluck their eyebrows at home. Eyebrows can have a big impact on your look. Women usually either neglect them totally or on the contrary, they start to over pluck them. However it is better to avoid both of these two extremes. Many women don’t know how to pluck their eyebrows properly but they are experimenting with it. The importance of the eyebrows should not be underestimated. They can totally change your facial expressions. Neglected, shaggy eyebrows will give you a cluttered and untidy appearance. However, the right eyebrows can flatter your face and will make you look fresher, younger and tidier. One or two plucks in plus and your nice eyebrows can really look scary. 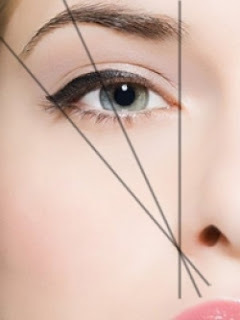 If you know what are the basic things to avoid when grooming your eyebrows, you can quickly learn how to correct your mistakes and how make them look perfect. Check out the most common ugly eyebrow mistakes! This is one of the most frequently met problems when it comes to brows. The majority of women and mainly young girls don’t consult a professional before tweezing their eyebrows for the first time and they easily develop a tendency to over pluck their eyebrows. If you make your eyebrows too thin, your eyes will get less accent, they won’t be so defined, and your face can get a dull, unexciting look. When you are over plucking your elbows, there is a possibility that on some parts it won’t grow back. As compared to the extremely thin brows look of the past, nowadays, the natural, fuller eyebrows are trendy. If you are endowed with thicker brows, you can create a wonderful, natural looking brow shape. Our advice is to consult a professional in order to get some tips and have them done properly. Once your cosmetician has determined their basic shape, you will only have to maintain their ideal form. If you have sparse eyebrows, don’t try to fix this problem by using dark eye pencils. This mistake is also very common. If you want to fill your brows, you can avoid this unnatural look by opting for a pencil that is one or two shades lighter than the color of your hair. Another great option is to use an angled brush and fill the sparse areas with brow powder. If your eyebrows are really sparse you can carefully fill these gaps, first with a pencil then by adding a little powder to make them look more natural. If you want to give your eyebrows a beautiful, natural contour, you can shape your brows by trimming those hairs that are too long, mainly in the front part. However, cutting down many hairs at once and trimming them too short can totally destroy the shape of your brows. In order to avoid this nasty problem, brush your eyebrow hair upwards and trim the hairs one by one, cutting only one at a time. Trim only those that are longer than the rest, not to make them too short. In order to achieve a wonderful shape, make sure that the inner part is a little bit thicker than the outer end of your brows. Short eyebrows look less elegant than nicely shaped, longer eyebrows. You can easily find the ideal end for your eyebrows by touching your brow bone. The point where this bone ends should also mark the end of your eyebrow. Grooming your eyebrows every day is too much because it is not necessary to pluck them too often. Your eyebrows will look gorgeous if you tweeze them only once in a week. If you develop the bad habit to groom them each and every day, you can also remove hairs that are essential to maintain their beautiful contour. 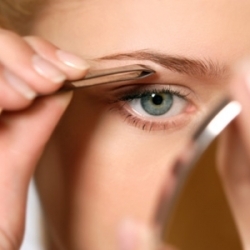 Start to stay away from the tweezers so that you won’t feel the necessity to pluck your brows. Having well shaped, perfect eyebrows is as important as makeup or clothing. If you have a great contour to your eyebrows your eyes will get more emphasis and your look will become deeper and more sensual. Beautiful brows give a nice frame to your face and your whole appearance will be more youthful and feminine.